Shortcut Vegan Lahmajoun with Sabra® | Happy National Hummus Day! I’m honored to be working with Sabra® to promote National Hummus Day. Thank you for considering the brands I partner with and endorse. Traditionally, lahmajoun is made using minced beef and/or lamb. For my vegan version, I’m substituting Supremely Spicy Hummus from Sabra® and some chickpeas. 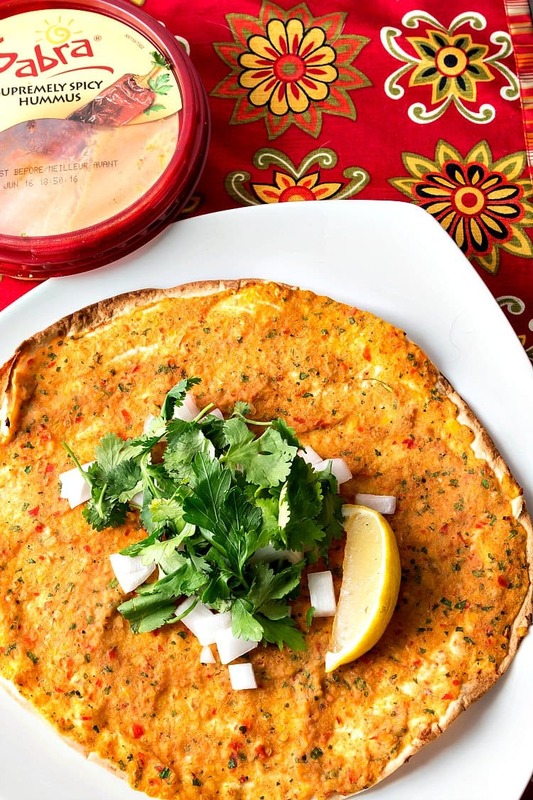 To tone down the spicing, this vegan lahmajoun would also be fantastic made with Roasted Pine Nut Hummus, Roasted Garlic Hummus, Roasted Red Pepper Hummus or Classic Hummus. Yup, it’s National Hummus Day this Saturday, May 13. Of course you probably have a container or three of hummus in your fridge. If you don’t, you really should, because it makes a great quick snack. But to celebrate hummus’s special day, we can–nay, should–do more than just dip it up with chips or cut vegetables. Hence the lahmajoun. Before we get to the recipe though, I want to talk about the deliciousness and versatility of Sabra® hummus. While not all the flavors are straight up traditional (hello, pizza hummus), all the flavors I’ve tried, and I’m pretty sure I’ve tried them all, are truly flavorful. And I’m also pleased to report that my latest shipment is all made with non-GMO oil. That’s huge! I know some of my readers have been concerned about that, so just know that Sabra® listens and takes customer feedback seriously. Sabra® hummus is also a good source of plant-based protein, and it is so versatile there really is no shortage of creative ways to use it in your cooking. Whether you’re eating vegan or vegetarian or you’re a full-on omnivore, hummus can have a place at your table. It certainly has one at mine, and I have the best time coming up with new and creative ways to get it into my face. You guys are going to love this vegan lahmajoun. Even if you’re not vegan, I promise you won’t miss the meat in this recipe. 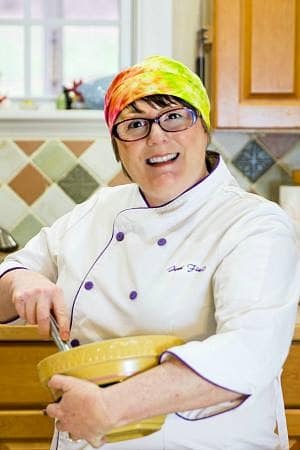 Before I share this recipe, here are a few favorites from other Sabra promotions. From left to right, Easy Delicious Hummus Toppings, Southern Cornbread with Hummus and Za’atar, Hummus Pinwheels with Spinach and Feta, and a nostalgic Balogna and Cheese Sandwich using Sabra Spreads. First, I need to give credit where credit it due. I didn’t just magically come up with this recipe without any context. I knew I wanted to make some version of a “pizza,” and initially I had considered Turkish pidé which are boat-shaped pizzas. But in my research, I found lahmajoun and decided to go with that. 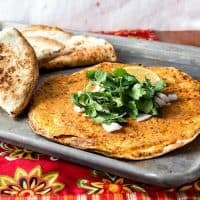 Thanks to The Armenian Kitchen for this article and permission to use flour tortillas as the base for my lahmajoun, and also to Heghineh Cooking Show on YouTube for her video on making vegetarian lahmajoun for her daughter. Here’s my quick video showing how I made my vegan lahmajoun. Rather than using red pepper paste, I used a combination of sweet red and yellow peppers, and in place of the tomato paste, I used 3 whole canned tomatoes. The rest I sort of made to taste using some of the herbs and spices Heghineh recommended. The result is most likely more the spirit of vegan lahmajoun rather than the letter, but have mercy, they are tasty! Watch some videos, read some recipes, and then get ready to make your own version. I highly recommend using the Sabra hummus, especially in vegan and vegetarian versions, since the flavor and consistency is already there. It makes a great base for your lahmajoun mixture. 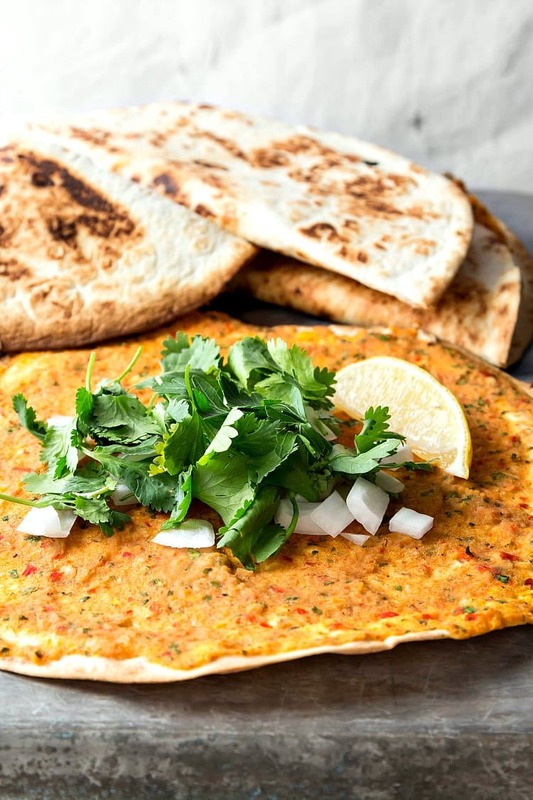 This vegan lahmajoun is bursting with peppery, garlicky, spicy flavor. Make your life easier by using flour tortillas as the base and then whip up the easy spread in your food processor. Place a rack in the bottom of your oven and preheat to 475F. Place a large, heavy bottomed skillet (I like cast iron) over medium heat. Add peppers, onion, tomatoes, and garlic (if using) to the bowl of your food processor. Pulse until you have a fairly smooth puree. Drain in a fine mesh strainer, pressing down lightly on the pureed vegetables to get out a fair bit of the liquid. Save that liquid for use in soups or stocks if you'd like. Return the drained puree to the food processor bowl and add the hummus, chickpeas, herbs, salt and spices. Place one flour tortilla in the hot, dry skillet and cook for 10-15 seconds until nicely browned on the bottom. Place the browned tortilla, browned side down, on a pizza pan or cookie sheet. Spread 1/4 cup of the vegetable hummus puree on the tortilla, spreading almost to the edges. Bake on the bottom rack for 6 minutes or until the edges of the tortilla are nicely browned and the filling has set. Fold in half to keep the filling warm. Serve as is, with a squirt of lemon juice, or wrapped around your choice of vegetables, pickles, and herbs. If you happen to have red pepper paste and tomato paste, use about 1-2 Tablespoons each in place of the sweet peppers and canned tomatoes I used. You most likely will then be able to skip the step of draining the vegetables before adding the chickpeas, hummus, etc. And there you have it, friends. Spicy, smoky, flavorful, crisp, and delicious and bursting with plant-based nutrition not only from the peppers and herbs, but also from the hummus. It doesn’t get much better, you guys! 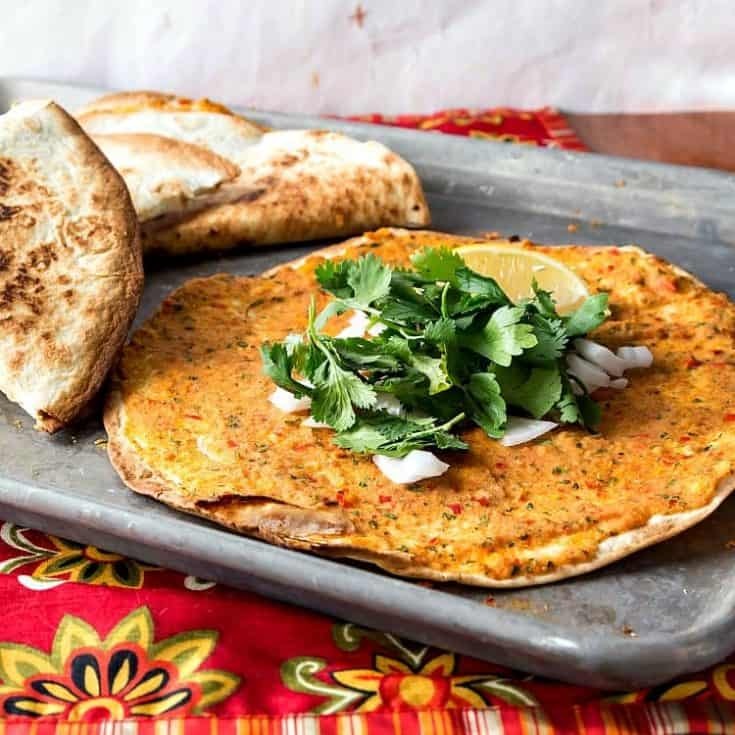 Enjoy the vegan lahmajoun, and celebrate National Hummus Day in style! Thank you for spending some time with me today. Have a lovely day.